Now that spring is well underway here in Georgia, all I can think about is being outdoors. Don't you know the feeling? You just want to throw open the windows, fill every vase you own with fresh flowers and surround yourself with color. One adorable spring-ish motif that I'm loving right now are sweet little birds. Truth be told, I'm not a huge fan of real birds, which is thanks to the fact that my best friend-- yes I'm calling you out in public, Sarah-- is deathly afraid and literally cries every time she sees a bird. It's kind of rubbed off on me over the years. But sweet little decor-related birds? Beyond precious and so perfect for spring. I'm definitely drooling over that Anthropologie vase. Incredible, right?! And you know I love that print, since it's hanging in my bedroom! Aren't these birds so tweet? Ha. I had to. 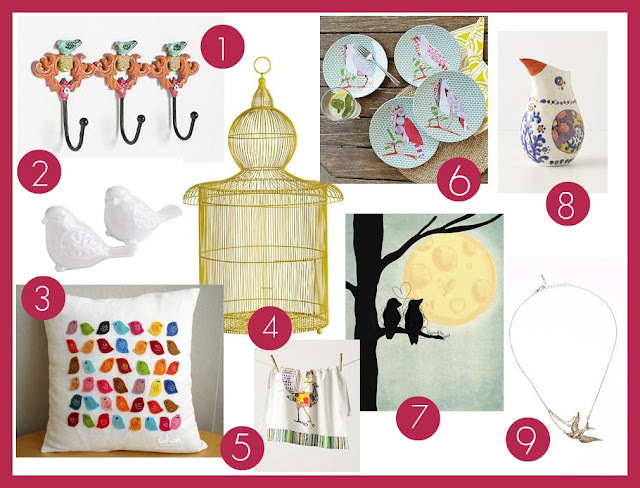 SO many cute little birdie inspirations...loving the pillow! So tweet! I love, love, love bird decor (and live birds too). The bird vase is fantastic and I love that bird print too. I am the same way about birds, I really cant stand them in real life (only from afar) but I love them in decor. That pillow especially! Love the West Elm plates! I'd be in big trouble if I were afraid of birds, as we have soooo many living amongst our lelands!! I love your montage of the bird decor. I love bird cages and bird houses, and my mom often used both in our house growing up. I, personally, have been lusting over the salt and pepper shakers. 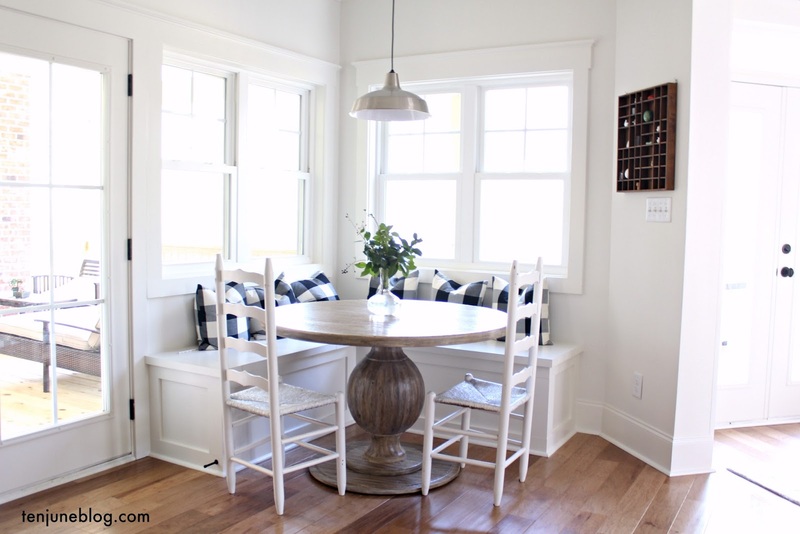 I've seen them all over the place lately and think they'd be a perfect addition to my kitchen table! I'm with you on both counts. Decor, good. Real thing, bad. You should see me run to the car like a crazy lady because of the nest under our awning. Love your choices. I am loving your bird decor choices. Too cute..My faves have to be the vase and the salt and pepper shakers. That necklace is pretty great too. As far as the real bird thing goes, I was always okay with birds until moving to the beach---and some pretty daring black birds gave me a run for my money, since then, a little terrified. Same! I really, really dislike birds in real life but adorable bird images get my every time! I just ordered these really cute bird tea lights from the showroom where I work. I can NOT wait til they come in and find a place in my home! so cute!! I love those bird plates!! I love using bird decor in the spring/summer too! I love every single one of these picks, but my favorites are probably the melamine plates from West Elm (I've had my eye on 'em for a while!) and that adorable linen pillowcase cover ... So cheerful! I'm obsessed with birds lately (: Such a beautiful inspiration board, girl! Ps. what program do you use to put that together? Powerpoint or something? I hate birds in real life (they scare me :\) but I love them in design. My husband doesn't get it. I love that pillow and the birdcage. That Anthro vase is so sweet. I may have to go by one for mothers day (and then buy an extra one for myself)! I dislike birds too -- mostly just big ones (and even more so birds kept as pets). We were over at a co-workers house for his surprise b-day party. His massive parrot, which had been freaking me out already with his weird eyes and beak, supposedly didn't fly. When we all shouted "surprise!" as the co-worker walked in, the bird took off and hit me as it flew in a frenzy before it landed on a shelf in the kitchen breaking everything on it! Yeah, so birds = no good.